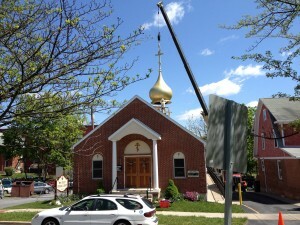 At 11 a.m. on Wednesday, April 25, a new 18-foot-high (including a six-foot high three-bar cross) 700-pound fiberglass dome was hoisted up by crane and set into place at Holy Trinity Orthodox Church at 119 South Sparks Street in State College. The church’s topping off completes a multiyear, half-million dollar renovation project that added 75 percent in additional program and worship space, as well as several large hand-painted murals that cover most of the building’s interior. The project was completely funded by the generous donations of dozens of local area parishioners. The installation was completed by Vyacheslav (Slava) Dmitriyev of the State College-based Better Homes LLC, who spent the last three weeks readying the gold dome and constructing the external framework onto which it was laid. Holy Trinity is a parish of the Orthodox Church in America (Archdiocese of Western Pennsylvania), the local autocephalous Orthodox Church in North America. Its 200-plus member Christian congregation has been led by the Archpriest John Reeves since 1996. To view pictures of the event, visit Holy Trinity’s Facebook page at facebook.com/holytrinitysc.